On the 18th August 2009 at 20:52LMT the Isle of Man registered bulk carrier “Ostende Max” and the Liberian registered oil tanker “Formosaproduct Brick” collided. The collision occurred in the Precautionary Area adjoining the Traffic Separation Schemes in the Malacca Straits to the south west of Port Dickson, Malaysia within Malaysian territorial waters. This case was extremely unfortunate involving a tragic loss of life. Nine crew members were killed with other crew members injured on the Formosaproduct Brick. Three crew members were injured on board the Ostende Max. Both vessels incurred significant fire and structural damage as a result of the collision. 1918 : OM leaves the berth with a pilot on board using tug assistance forward and aft. 1944 : Pilot leaves the bridge to depart the vessel. 1948 : The Pilot disembarks the vessel to the pilot boat in position 02-32.47N 101-42.83E. Vessel proceeds outbound, present on the bridge are Master, CO, 2O and Helmsman. The 2O is not part of the bridge team or contributing to the navigation of the vessel, he is catching up on some work at the Chart table. 1950 : Speed is gradually increased as the vessel leaves the buoyed channel and heads towards the TSS Precautionary Area. 1952 : The Master discusses with the CO the NW bound traffic in the TSS and the available sea room to starboard for crossing the NW bound TSS lane. 1954 : The Mas – er is irritated by the RPM limitations imposed by the changing of a unit. Full Ahead Manoeuvring is set. (The limitations are concerned with running in a cylinder liner for a certain amount of time at a specified RPM). 2008 : The Master leaves the bridge and goes to his cabin. The CO is the OOW with responsibility for the navigation of the vessel. 2010 : 3O arrives on the bridge for his 2000-2400 navigational watchkeeping duties. 2012 – CO discusses with 3O about crossing ahead of NW bound traffic in Precautionary area and is satisfied there will be no problems crossing the NW TSS lane. 2013 – OM alters course to 203ºG in position 02-28.35 N 101-42.86E. CO states that the two crossing vessels in the NW TSS lane to port should go around the stern. 2015 : The Master arrives back on the bridge, talks to the Ch Eng on the phone then leaves the bridge to goes onto the starboard bridge wing for a cigarette. The Master then enters the Wheelhouse and states to the OOW that he is to call him if there are any problems. 2016 : 3O is joking with the helmsman about his homeland and orders course 205ºG in position 02-27.82N 101-42.73E. 2018 : The CO and 3O discuss how to cross the traffic NW bound TSS lane. It is anticipated the OM will have to alter course to starboard. The Master asks the CO which way they will pass the traffic on the portside. The CO says he will probably have to alter course to starboard. 2019 : Klang VTS calls OM as the Master, CO and 3O are busy discussing the crossing situation. With no immediate response from OM Klang VTS calls vessel “Renate N” to inform them of the close quarters situation developing with OM. Klang VTS advises “Renate N” to call OM and observe the situation with caution. The 3O responds to Klang VTS during this radio communication however Klang VTS is communicating with other vessels and does not respond back to OM. 2021 : OM is called by “Renate N”, a crossing vessel on the port side in the NW bound lane concerned at the CPA (0.16nm). Renate N: OM, Renate N, Please come in Channel 10. Renate N: Yes you have ship on your port bow, you join the lane, you join the lane? It‟s very close, very close. CO: Just ask him if starboard is fine for him. OM: Ok I change my course to my starboard, I change my course to my starboard. Will it be OK for you? Renate N: Ok, thank you thank you. 3O: Which one is it? CO: Probably this one [pointing to the ARPA], this is the one. After the 3O discusses the situation with the CO the 3O communicates with the “Renate N” that the OM will alter course to starboard. OM alters course to 215ºG in position 02-26.82N 101-42.32E. A discussion on the bridge about the possibility of altering to port occurs but is quickly rejected by the Master as it would result in a potential collision situation. The CO states a turn to starboard will help the traffic situation on the portside too. The 3O asks to have a cigarette on the bridge wing but is refused by the CO.
2023 : Ch Eng arrives on the bridge. 2024 : The Master enquires about the vessels on the portside and is informed they will pass astern with the change of course to starboard. The Master feels the CPA of the Renate N (0.17m) is too close. The CO suggests altering 5 degrees to starboard. 2026 : The Chief Engineer enquires with the Master about slowing down for running in a new cylinder liner. The Master and CO agree to slowing down once they are happy with the traffic situation on the portside. The Chief Engineer then leaves the bridge. 2027 : The Chief Engineer phones the bridge about slowing down, the 3O enquires with the CO and Master and tells the Ch Eng. in 20 minutes time because of the crossing traffic on the portside. 2028 : The bridge team briefly discuss the effects of a speed change on the traffic situation on the starboard side (the group of ships includes the FPB, Bic Irini and Southern Highway) stating that if they slow down the crossing traffic to starboard should pass ahead quicker. 2029 : The Master discusses with the bridge team about which of the vessels to starboard to go astern of, then turn to port to join the scheme and then slow down. 2030 : The Master calls the Chief Engineer and informs him the vessel is in the precautionary area but if needed can slow down. The Chief Engineer requests to go half ahead for 10 minutes then go full ahead. This is agreed by the Master who then sets half ahead. Telegraph is set to half ahead. The Master asks the Ch. Eng. to call the bridge every time a speed change is required. The Master informs the Bridge team that they will go half ahead for 10 minutes then go full ahead. 2031 : The 3O, 2O and CO briefly discuss their bridge watching keeping rota. The helmsman asks the Master if he can be changed on the helm but is refused saying there is not much more required in hand steering. [There is no additional Lookout on the Bridge]. The Master leaves the bridge whilst informing the bridge officers that he is going to send some messages and will see the bridge officers in the morning. 2032 : OM is abeam with the last vessel in the NW bound lane and continues heading 225ºG. [The option to alter course to port towards the SE bound TSS lane is now available]. The bridge officers discuss the “Chrystal Beauty” ahead that is turning to starboard to enter the DW Channel. 2033 : The Bridge Team observes the Chrystal Beauty off the starboard bow alter course to starboard to enter the Deep Water Channel. 2034 : The Master enters the bridge. The 3O asks the Master to look at the traffic situation. The 3O seeks confirmation from the Master stating they are waiting to turn behind the Southern Highway. The Master confirms to turn astern of the group of vessels off the starboard bow. The Master informs the CO he is leaving the bridge and will send an ETA. The Master leaves the bridge. 2035 : The bridge team discuss turning astern of the group of vessels to starboard and the next course to be steered. They state their next course will be 190ºT [before coming round to 130ºT]. The CO asks the 2O to fetch him a drink. 3O: Is it better to go to portside or starboard side? The 2O (responsible for the Passage Planning) explains the track is drawn to the left of the TSS Lane as is sometimes difficult to enter the lane. 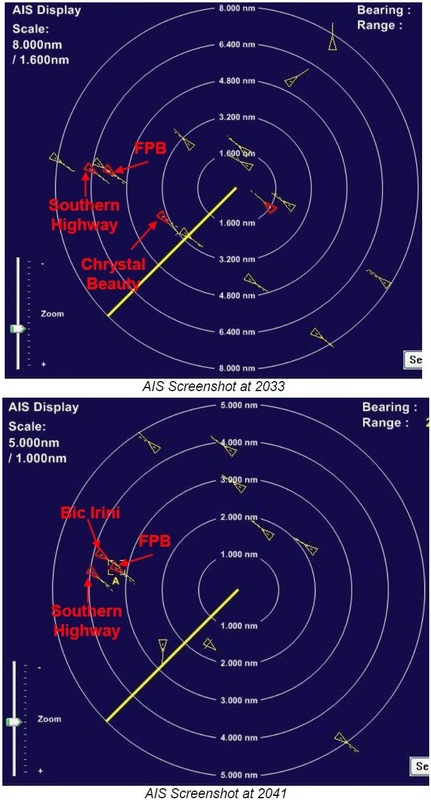 The 3O states he sees a container vessel through the binoculars [possibly referring to the Southern Highway, a car carrier as no container vessels are in the south east bound lane]. 2038 : The 3O and CO discuss lights from vessels off the starboard bow. 2039 : The Chief Engineer enters the Bridge and it is agreed Full Away Sea Passage will be at 2100. The CO and the Chief Engineer discuss water tank quantities and the draught of the vessel. 2040 : The Chief Engineer leaves the bridge. 2041 : FPB contacts OM enquiring at OM‟s intentions. [First contact with FPB, range 3.55nm]. FPB: OM OM FPB calling. FPB: What time you altering course to your portside? OM: Please repeat me your name? FPB: Formosaproduct Brick, Formosaproduct Brick, distance from you is 3.2nm, on your starboard bow starboard side, you will passing my ahead. OM: please wait moment, wait moment. FPB: OK, can you change your course to portside? Phone call – 3O answers the call from the engine room then sets the telegraph to Full Ahead. OM: OK, I change my course to my starboard side, I change my course to my starboard side. CO: No we can‟t do that. We can‟t do that. CO: No, echoes. This is this one, these two [referring to radar targets]. 3O: Shall we go more to starboard? Just turn a bit. OM: Yes, all time I change my course to my starboard side. CO: But we have her on 4, they could also turn to starboard. She‟s got a nice…[possibly referring to the available sea room on Southern Highway‟s starboard side]. 250 will be right. FPB: OM change your course to starboard side more, too much too much. The FPB alters course to starboard slightly in an attempt to increase the CPA with the OM. 2049 : Various VHF radio chatter is heard from other vessels in the vicinity insulting OM‟s actions. CO: This is this one [referring to radar]. Helmsman confirms 250 is being steered. CO: Fine she will pass. She will make it. It was obvious that she will pass. Everything is fine. This one will go [Southern Highway CPA 0.46nm]… The second is trying to barge through [referring to Bic Irini]. 2050 : The 3O checks the AIS and informs the CO of the vessel name “Bic Irini”. The Bic Irini is approximately 1.39nm off the starboard beam. [The 3O and CO are now under the impression the “Bic Irini” is the FPB and the Southern Highway is the FPB]. CO: We have to go behind her stern [referring to Southern Highway]. 3O: Which one? Behind her stern? CO: This one because we will f..k her. CO: No. We will pass. To … they are fortunately passing. 3O: To Starboard? How much to starboard? CO: This one is passing. No, we can‟t go to starboard because… [Probably referring to the FPB which they think is the Bic Irini]. CO: To portside. Hard to port! 3O: Hard to port! Portside? 2052 : Collision occurs between Ostende Max and Formosa Product Brick in position 02-23.25N 101-38.66E. Ostende Max‟s heading is 245ºG at speed 11.1kts (full ahead manoeuvring) FPB‟s heading is 142ºT at speed 13.5kts (full ahead sea speed). 5 seconds after collision the telegraph is acknowledged by the Engine Room. A massive explosion occurs on the FPB as a cargo tank ruptures. Naphtha cargo spills from the FPB and ignites. The ignited spill engulfs the sea surrounding the Ostende Max. The Ostende Max and Formosaproduct Brick suffer significant structural damage. The hull paintwork of the OM is set alight. A small fire occurs on the foc‟s‟le deck of the OM. The picture below is from a film clip taken by a passing ship which shows the scene shortly after collision post separation of the vessels. 2052 : Master arrives on bridge. General Alarm sounded. Crew is unable to Muster in the designated Muster area outside due to the extreme air temperature from the fire. The 3O and CO leave the bridge to carry out their emergency muster duties. The 2O remains on the bridge to carry out his emergency muster duties. OM sends a “Mayday” signal by VHF Radio. Crew are beginning to make their way to their muster stations with immersion suits. They are prevented from mustering outside at the designated muster point due to the extreme air temperature. There is an impromptu muster inside the accommodation block by the emergency equipment locker. The fire pump is now running. The 3O opens hydrants on the main deck for boundary cooling as he makes his way to the poop deck. The 3O helps unlash and prepare the starboard lifeboat for launching and checks crew members for injuries. Some crew suggest throwing liferafts overboard but are refused by the 3/O as there is burning naphtha around the vessel. A fire party goes forward down the starboard side main deck due to the extreme air temperature on the portside of the vessel to fight a small fire on the fo‟c‟sle deck. Jets are sprayed forward from the aft end of cargo hold 1 on the port side. Hydrants are opened on the portside main deck for boundary cooling. 2056 : Ostende Max has separated from Formosa Product Brick using the astern propulsion. 2057 : Master of the FPB sends a “Mayday” signal by VHF Radio. 2058 : The vessel “Bic Irini” sends an “All Ships” message by VHF Radio informing vessels in the vicinity of a collision. 2059 : Master of the FPB sends a “Mayday” signal by VHF Radio. 2108 : The Master of the OM sends a “Mayday” signal by VHF Radio to Port Dickson. 2110 : First of many communications with the vessel‟s Technical Managers by satellite phone after the Master initiated the vessel‟s Ship Security Alert System. 2119 : The Master informs Klang VTS that the vessel is afloat and that everyone on board is safe. 2120 : The Master informs Klang VTS that there is no fire (fo‟c‟sle fire now extinguished) on board he will proceed to Port Dickson anchorage. 2128 : The Cypriot Registered “Nordspring” (container vessel) is assisting at the scene of the FPB. The “Nordspring” is the only vessel to assist out of the numerous passing vessels in the TSS lanes. 2144 : The OM is over flown by a Malaysian helicopter assessing the scene. 2223 : The OM informs the Technical Managers that the hold, ballast and bilges are OK with damage to the forepeak and bulbous bow. 2339 : The Master calls Klang VTS and informs them that he is standing by to assist the vessel on fire and also requests permission to proceed with the voyage. 2342 : The Master is informed that he must remain at the scene and that he should anchor the vessel or drift. He is also asked if it is possible to receive the 14 rescued crew from the FPB. This question is not understood. 0003 : Klang VTS asks the “Nordspring” to proceed to the inshore traffic zone to transfer the rescued crew ashore. 0051 : The Master of the OM contacts the “Nordspring” where some details are given including the FPB‟s name and number of people rescued. 0128 : The OM anchors in position 02-29.5N 101-41.5E. 0140 : The “Nordspring” anchors and transfers survivors to the Malaysian authorities. The FPB continues to drift, the aft cargo area and accommodation block fire is eventually extinguished as the exposed naphtha cargo is consumed by the fire and also by the rescue vessels in attendance. A rating suffered a cracked rib when falling down stairs carrying a laundry basket at the time of collision. A rating suffered severe burns from the air temperature and touching the vessel‟s steelwork when proceeding outside to the muster station. A rating suffered burns from the air temperature when proceeding outside to the muster station. Nine crew members were killed in various locations around the accommodation block and engine room. Some of the survivors were treated at the local hospital in Port Dickson when they were landed ashore from the vessel “Nordspring”. 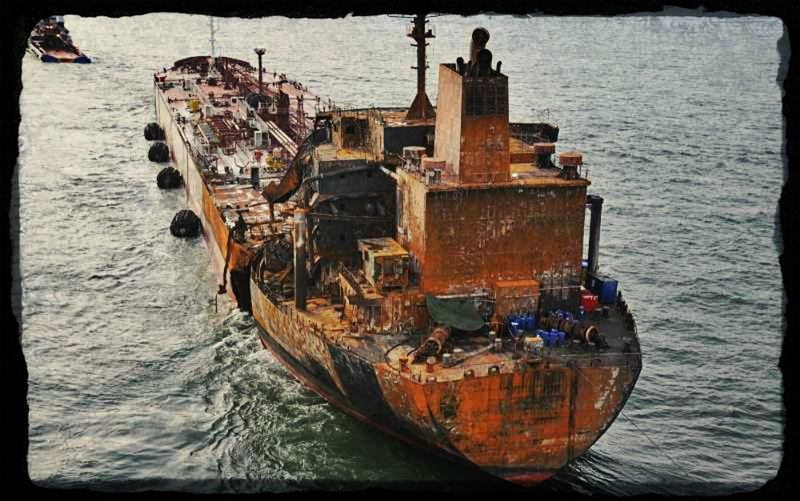 As a result of the collision the FPB spilled a large quantity of naphtha cargo into the sea from the portside after most cargo tank immediately in front of the accommodation block. Naphtha is flammable, insolvent in water and has a lower specific gravity than water. Therefore the spilled cargo floated on the surface of the water. 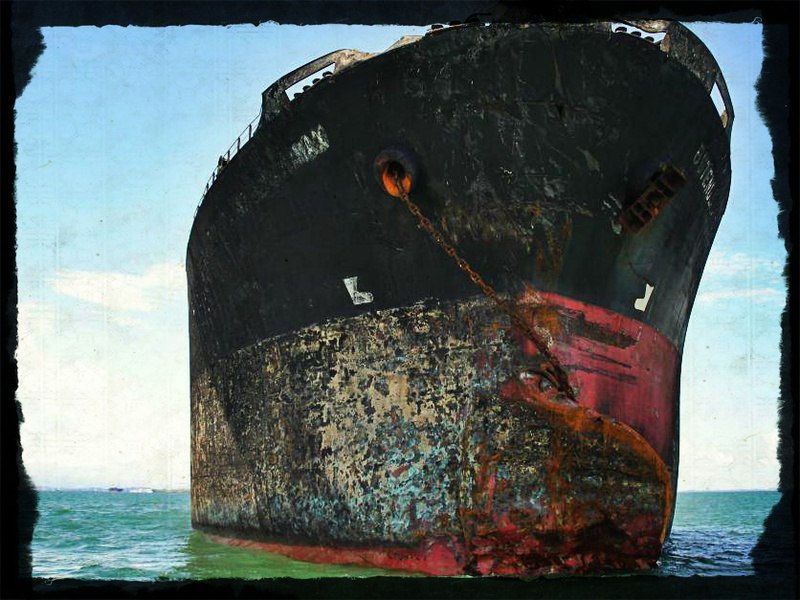 It was this cargo that engulfed the hull of the Ostende Max whilst on fire. The spilled naphtha cargo was eventually consumed by fire. According to the accident investigation coclusion the FPB was the Stand-on Vessel and the OM was the Give Way vessel in the Crossing Situation. The collision occurred due to the OM failing to take effective avoiding action and the FPB being severely restricted to take avoiding action under their respective responsibilities according the Crossing Situation Rule (Rule 15 and associated Rules 16 and 17) prescribed by the COLREGs. 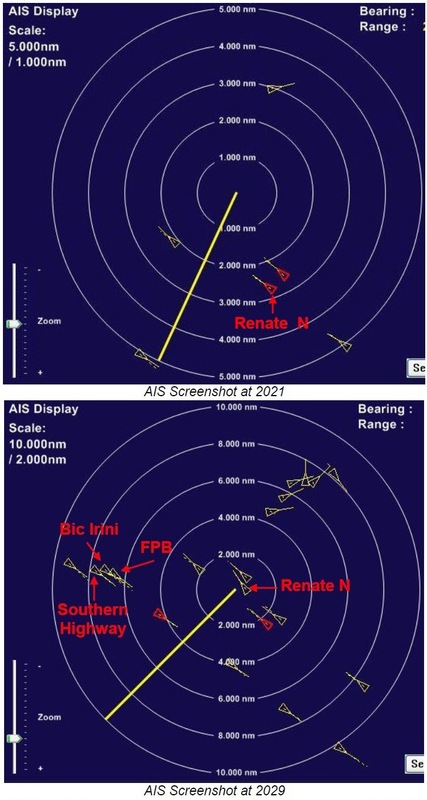 The FPB and OM were clearly able to be observed visually and monitored by the electronic navigation aids for a considerable time prior to the collision. This case also highlights the importance for vessels not to allow themselves to become severely restricted by other vessels in their ability to comply with the COLREGs. Adequate contingency room should always be left to allow for an escape route if other vessels appear not be complying with the COLREGs. 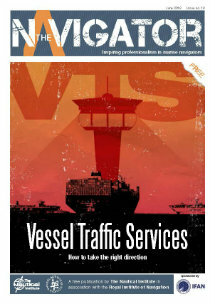 Where vessels transit areas where levels of traffic are likely to be significant, the Master should consider placing the engine on manoeuvring readiness, especially if Routing Guidance for the area advises such. The crew of the Cypriot registered “Nordspring” should be commended for their actions being the only vessel in the vicinity to offer and render assistance to the crew of the FPB. Distribute this report to Enterprises Shipping and Trading and the Officers and Crew concerned. Promulgate information and guidance to Manx vessels about the safe use of AIS and VHF when in a collision situation. Further promote the need for Officers in Charge of Navigation watches not to be distracted when keeping a look out and discourage any practices on a Ship‟s bridge that interfere with or detract from keeping a safe lookout. Forward a copy of this report to the Polish Maritime Authority. Revoke the Isle of Man issued STCW Endorsements of the Master, Chief Officer and Third Officer of the Ostende Max at the time of the collision. Consider further formal investigation into the actions of the Master, Chief Officer and Third Officer of the Ostende Max at the time of the collision. Conduct a thorough review into Bridge Team Management and how their requirements for effective Bridge Team Management are effectively implemented on vessels managed by them. Conduct stricter auditing of vessels to ensure proper compliance with the Technical Manager‟s procedures, application of the COLREGs, Bridge Team Management and lookout practices and where possible conducted whilst on passage. Recommend to Masters that Watch Type C is implemented to ensure better visual lookout when transiting Precautionary Areas and crossing TSS lanes when high traffic density is reasonably expected. Review the Change of Watch handover procedure to ensure a proper exchange of information by verbal and other appropriate means to prevent the oncoming OOW from finding out all of the information himself. Ensure non-company supplied, non-approved navigation equipment and software are prohibited for use on company vessels and develop systems and/or procedures to ensure such systems (such as the pirated Electronic Chart systems) cannot be utilised on company vessels. Ensure position fixing is verified by appropriate means at appropriate intervals. Consider the implementation of an additional muster point, verified by a PA announcement, for use when the primary Muster Point is inaccessible.